City Parks Foundation is kicking off its 2019 Spring sports program for seniors this April. CityParks Seniors Fitness, presented in partnership with New York Road Runners, is held in 17 neighborhood parks in all 5 boroughs. Seniors Fitness, offered from April 22 – June 14, gives New Yorkers 60+ the chance to participate in free tennis lessons, yoga and fitness walking. All equipment is provided. 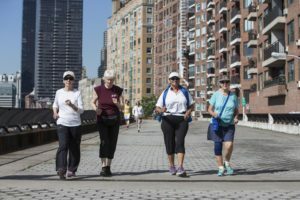 The program has served over 10,000 participants since it began in 2006 and encourages older New Yorkers to maximize their health benefits by staying active. Online registration is now open for all spring programs at CityParksFoundation.org/play. Participants are encouraged to register online in advance, though walk-up participants may register on-site if space permits. For more information and a full list of City Parks Foundation’s 2019 sports programs, please visit www.CityParksFoundation.org. Please contact sports@cityparksfoundation.org or call (718) 760-6999 for any questions. S. Oxford St. & Atlantic Ave.
E. 86th St. & East End Ave.
207th St. & Seaman Ave.